In March 2013, the Mayor of London, Boris Johnson, announced plans to spend nearly £1billion across London over ten years to improve cycling infrastructure. How best can the funding that Sutton will receive be spent? And what would inspire you to get cycling? As part of their Space for Cycling initiative, the London Cycling Campaign would like to hear your ideas and suggestions for improvements in your neighbourhood that will help begin the process of ultimately make cycling in Sutton feel as safe, inviting and inclusive as it is today in the Netherlands. To help us develop our plans in Sutton, we are holding a promotional event and exhibition on Saturday, 22 February 2014 above TazZa Coffee, 188 High Street, Sutton, SM1 1NR. This drop-in event is an opportunity for everyone, whether they cycle yet or not, to help put Sutton on track to become a cycle-friendly borough. You will get the opportunity to select one ‘theme’, out of a choice of six, that you feel will help create the kind of conditions locally to make cycling a real, and comfortable, transport choice for many more people. Space for Cycling is a London-wide initiative from the London Cycling Campaign, the purpose of which is to engage with all candidates who are standing in the council elections in May 2014, in all of London’s 600+ wards (including 18 in Sutton). Please stop by at our event anytime between 9.30am and 4pm, on Saturday 22 February, to view, discuss and talk through some ideas. Between us, we may just make 2014 the year in which cycling starts to get the full recognition it deserves in Sutton. 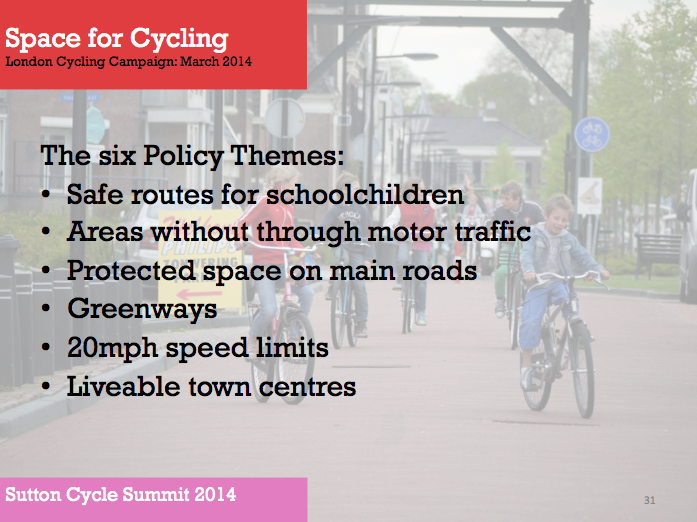 Update 20 February 2014: …or complete our Space for Cycling survey. ‹ Good start for cyclists at Carshalton Station, but why keep it a secret?